It was my first time to visit Davao. And based on my very limited knowledge of the city, all I knew prior to visiting the place was that it's in Mindanao and it's popular for the durian fruit. So everything else I was going to experience was surely going to be educational for me. I was very fortunate to be invited by http://www.davaofoodtrip.org to the Davao Food Appreciation Tour (DFAT), which was a three day event from March 14 - 16, 2008. With over a dozen bloggers and 8 participating establishments, we were prepared to eat and blog over the three day event. 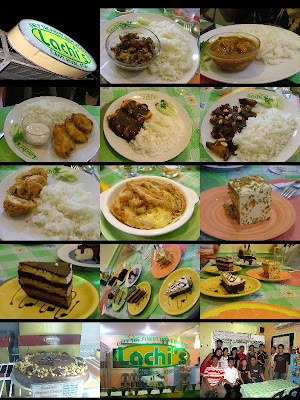 Aileen , Andrew , Angel , Blogie, Dom , Gwing , Migs , Mikko , Ria , Tiara , Winston and I visited the first stop on the food tour: Lachi's Sansrival Atbp. It's at the corner of Ruby Street in Marfori Heights, Davao City. They offer Filipino food and desserts. We were served a lot of their tasteful dishes such as Roast Pork, Cordon Bleu, Caramel Beef, Pork Marinara, Fish Fillet, Lechon Paksiw and Tofu garnered in sauce. I guess some of the people were looking our way when everybody whipped out their cameras and took turns taking pictures of all the dishes before tasting them. My personal favorite would have to be the Pork Marinara for its pork strips layered on top with a hidden tasteful tomato base underneath. Just as we were delightly full from dinner, our gracious hosts Mike and Melvin Aviles (who happen to be twins co-owning Lachi's) served us very generous slices of their finest cakes. Chocolate Pie, Dark Cheesecake, Midnight Delight, Choco-Vanilla Cheesecake, Roasted Walnut Choco Supreme, Carrot Cake and Cashew Mocha Torte are a few of the many cakes they offer. All the cakes were delicious that it was difficult to pick one single cake that stood out. However, if I had to choose one, I'd highly recommend their Sansrival. Being a part of the restaurant's name is a hint that it's one of their most popular recommendations. The 1st day of the Davao Food Appreciation Tour ended with some R&R in the form of videoke where we exercised our vocal chords followed by Fagioli's, a coffee shop, were we exercised our fingers blogging about our first day. Everybody brought out their laptops and started digitizing the 1st part of the food experience. Even if Fagioli's is not officially on the food tour, I'd like to make a special mention about their restroom. If you happen to drop by, don't forget to visit their restroom. I thought I entered the wrong room as it looked "heavenly". Day 1 was a success. Great food with great company was a great combination to kick off the food tour. Hi Jay! Thanks for visiting Davao to join us! Very nice review. You can't go wrong with Lachis. Excellent service and food combined. Yum! @Blogie: Kung may kasunod, sana makasama... yumyum !